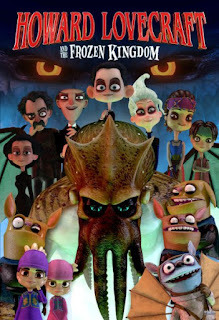 HOWARD LOVECRAFT AND THE FROZEN KINGDOM is an animated feature that falls into that damning netherworld. It's not sophisticated enough to appeal to adults, but too slow for children to repeat-watch it into that coveted “nostalgic classic” status. Some historians say it was syphilis-induced, but the film’s plot says dad’s crazy because of his experiences with ancient, dark magic, which he has written about in a book he calls the Necronomicon. Howard reads from his father's forbidden tome and is transported to the titular icy landscape. The youngster encounters some of the creatures who will later inhabit his stories, weaving in the fantastical mythos of Lovecraft’s own fiction. Most notable is the tentacled and winged beast Cthulhu, the most famous of the large and terrifying entities known as Great Old Ones in Lovecraft’s universe. Here, Cthulhu is a puppy-dog-eyed pet to Howard, who calls him “Spot.” While this was also his nickname in the comic book, the character still maintained much of his ferocious look within the shadowy illustrations there. This murky visual style - a nod to the Lovecraft’s frequent theme of fearing the unknown - and the juxtaposition of goofy humor make the tone work in the comic. That version was clearly aimed at pre-teens and up, and it doesn’t feel cheesy because the visuals are still frightening. Here, in favor of making more kid-friendly material, most of the scariness, particularly in aesthetic, has been eroded into safer, softer shapes. Any darker elements now resemble the lighter side of Tim Burton's work. There are some charming beasts, especially for fans of cute-creepy. The govlins are a chuckle-inducing group that are really just this movie’s version of Minions, but less annoying. While some scenes and characters look quite good, on the whole the animation feels unpolished and, at times, unfinished. Shooting for this Dreamworks/Pixar-esque look is just asking for comparisons. The movie often looks cheap, with some scenes resembling subpar video game animation. The nail in its coffin is the film's muddled plot, further doomed by confusing dialogue that at times seems to contradict itself. For a kids movie, it’s wordy and dry. Halfway through, most of the audience will struggle to care about the story at all. It appears director/writer/producer Sean Patrick O’Reilly, who also stars as Cthulhu/Spot, took on adapting the graphic novel as a passion project. Unfortunately, he cast many of his family in roles, and most of the voice acting comes off as amateurish. Perhaps all around the film may have benefitted from more creative input from a larger pool of artists. 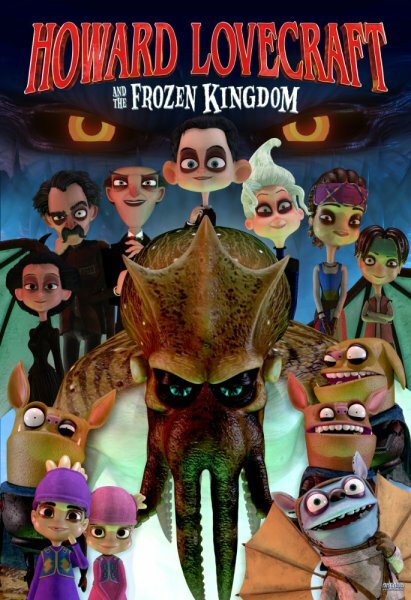 That may be the only hope for the rest of the trilogy, with the sequel HOWARD LOVECRAFT AND THE UNDERSEA KINGDOM being quite confidently advertised in a post-credits scene here.